He offered the example of his decision to have an auto repair done, as his mechanic suggested, or to forgo the work. Does the social-centric, connectivistly-constructed world inform our decision-making process? He argued that it essentially does not. He called a knowledgeable friend, weighed the (hopefully) trusted mechanic’s opinion, and decided to have the work done. I argued that, certainly within organizations, things have shifted (or are shifting) to alternative ways of decision-making. When we need to make an informed work-place or project-based decision, simply relying on the handful of experts available to us hamstrings both our efforts, and our organization’s agility and long-term viability. Let’s be clear: I’m NOT suggesting eliciting advice from all quarters, consensus-building or democratic workplace processes. All these more often than not lead to organizational paralysis and an unacceptable lack or agility. What I am suggesting is that individual knowledge (experience + expertise) be systematically captured, cataloged and shared; at the same time, organizational decision-making be documented and then inform the next divergent event. 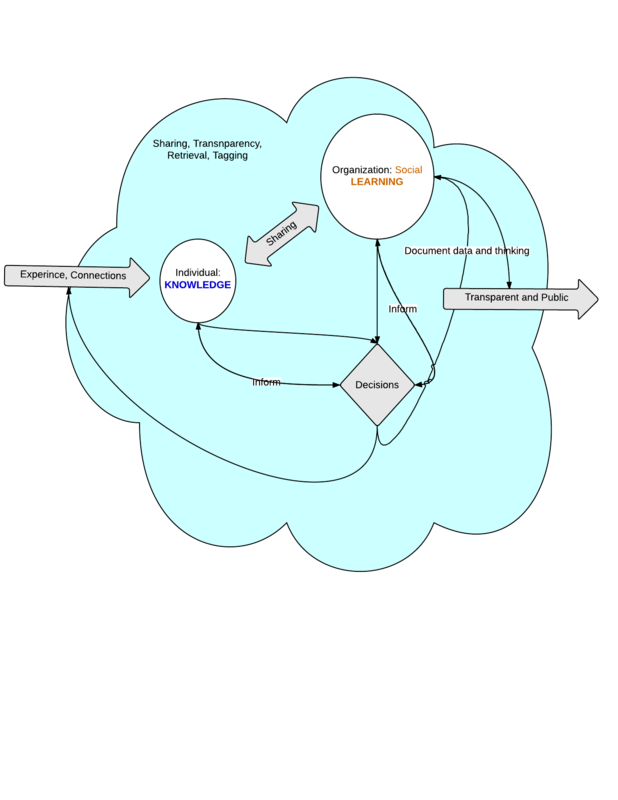 My rather poorly-rendered depiction of the knowledge-learning-decision loop. The blue cloud is the systematic practice. This is not an essentially digital learning process: this is what Peter Senge, et. al., have been saying for 20+ years. However, digital-social technology has made this easier, more transparent and in fact far more necessary than ever. Success will shine on those organizations that have the culture and practices to nurture individual knowledge management and growth. Reciprocally, professional development is there for individuals to manage for themselves by the virtuous feedback loop of person-to-organization. Knowledge is personal, learning is social, and they both require deliberate, coordinated management. So, I can call my Uncle Harold (well, were he still alive) to ask him about my transmission work. But, far better would be to have been following him for the last several years, to follow those folks whom he finds valuable, and for me to share that socially curated content with others, including my mechanic. Then, I’d weigh my mechanic’s recommendation against–or in coordination with–those data points. The final act in this small loop would be for me to share my decision, and the data that informed it, with all who care to find it. It’s the Show Your Work movement, writ small. Thanks for the challenge, Steve, and happy driving. I’ve updated this post to correct the spelling error in the title… using my phone at the airport. What a world. So why won’t wp spellchecker correct titles?